The all new Taktis product range combines the very latest hardware and software to produce a control and indication system, which is powerful and sophisticated, yet simple to use and understand. 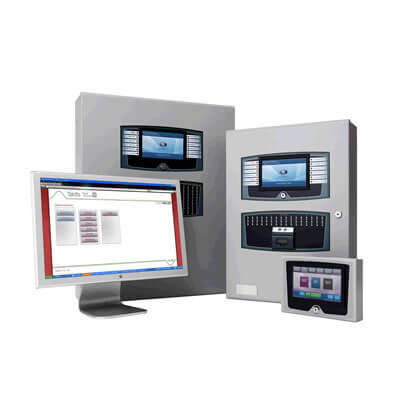 Taktis Vision provides a means of allowing full display and optional control of the Taktis fire alarm control panel from a small and unobtrusive local control station. Based on an all new hardware and software platform, the large, full colour graphical display with touch screen functionality, delivers information on the status of the fire alarm system to single or multiple locations. Taktis Vision repeaters can be configured to offer full display and control to replicate the functionality of the fire control panel or to operate as a simple, display only device for applications where access to control the fire alarm system would be inappropriate. To compliment the new, market leading range of control systems. Virtual Resource is a unique suite of software tools aimed to deliver a whole new dimension in Life Safety System Management. It provides System Designers, Integrators and Service Companies with the ability to remotely access and comprehensively manage any system using intelligent analysis of data collected from those systems. End-users and facilities managers can also greatly benefit from the powerful feature set that comes with Virtual Resource. Virtual Resource is based on technology successfully trialled for many years and is one of the most technically advanced management tools for fire detection and other safety systems on the market. With Virtual Resource, Installers and Service providers are able to offer market leading functionality through remote management and provide improved service at lower cost and greater efficiency. The remote management features offered by Virtual Resource can result in reduced fault call outs, improved servicing regimes, more effective maintenance, reduction of unwanted alarms and improved overall service to the end user. Whether you are a Service provider, building owner or facilities manager, change the way you think about managing your Fire Detection System. Taktis VR you can reduce costs, add value and improve service integrity by employing the latest communication and analytical technologies.